At the age of 17 Alessandro applied at the well-established Conservatorio di Musica ‘Luigi Cherubini’ in Florence. His application was naturally accepted, and he was soon performing the leading parts of famous operas on various European stages. In 1989, he won the first prize at the ‘Concorso Lirico Internazionale’ in Mantova, a competition dedicated to Italian soprano singer Katia Ricciarelli. The prize marked the start of a brilliant career in the world of opera. In 1990, the singer made his debut as ‘Rodolfo’, the male lead in Giacomo Puccini’s La Bohème, next to Katia Ricciarelli. He went on to perform in some of the world’s most prestigious venues, including the Barbican in London, Teatro Bibiena in Mantova (where he performed Paisiello’s Il Barbiere Di Siviglia), Basilea (I Capuleti E Montecchi), Strasbourg (L’Elisir D’Amore), Marseille (Il Barbiere Di Siviglia once more) and at the Wexford International Festival in Ireland (Rusalka). He received lavish praise for his role as Vladimir Lenski in the opera Eugenio Onieghin, at the Teatro Massimo in Palermo. Alessandro also provides particular attention to the ‘holy’ repertoire: he sang Gounod’s La Messa in the Basilica of Saint-Denis, as well as Puccini’s La Messa Di Gloria and La Petite Messe Solennelle, again next to Katia Ricciarelli. As for operettas, he performed Sissi, Rose Marie, Orfeo All’Inferno and La Vedova Allegra in Teatro Verdi in Trieste and again Orfeo All’Inferno and La Vedova Allegra at Teatro Massimo in Palermo. Although Alessandro is entirely wrapped up in his love for classical music, and especially fond of the legendary tenor Enrico Caruso, he is also inspired by modern pop music like U2, Genesis, Depeche Mode and The Clash. In recent years he has shown the urge to combine the two musical genres, classical and pop – thus bringing classical music closer to the people. In the 90’s, Safina’s impressive vocal talents were brought to the attention of renowned Italian pianist and composer Romano Musumarra, and the pair quickly began to record together, starting with the song LA SETE DI VIVERE, in attempt to bring Safina’s dream of creating a “soulful new pop opera music” to fruition. The end result was Alessandro’s debut album INSIEME A TE, released in 1999. The record is full of classic, soul and musical elements – Safina calls it “Opera-Rock”; prior to its release, the singer presented his new musical style for the first time in front of a live audience at the famous Olympia theatre in Paris. Safina’s definitive breakthrough to a pop audience took place in The Netherlands in November 2000, when he performed at the prestigious The Night Of The Proms celebration. His single LUNA stayed at the top of the charts for 14 weeks. Another two immensely successful Dutch concerts followed in 2001, this time in The Hague and Amsterdam, and took the handsome, charismatic tenor’s success to new heights. INSIEME A TE was eventually released in over 30 countries, received gold in Brazil and Taiwan and became four times platinum in The Netherlands within a few months. 2001 was a prolific year for Safina. The singer contributed to the score of Baz Luhrmann’s feature film Moulin Rouge, performing Elton John’s YOUR SONG with actor Ewan McGregor. In September of the same year, he performed live on stage at the ‘El Greco’ amphitheatre in Taormina. The ONLY YOU concert was later broadcast as part of the ‘Great Performances’ series by American public channel PBS, and released on DVD in February 2003. In November 2001, Safina was one of several prestigious guests (alongside Elton John, Cher and Jennifer Lopez) performing for Queen Elizabeth of England on the occasion of the 73rd Royal Variety Performance. He gave a masterly interpretation of Andrew Lloyd Webber’s MUSIC OF THE NIGHT. Not content yet with this success, the tenor embarked on a large-scale world tour, embracing in its span The Netherlands, several other European countries, Brazil (Sao Paolo and Rio), the USA (Safina seduces an enthusiastic audience at New York’s Radio City Hall), Canada and Korea. In Brazil he’s a guest performer at Barbara Hendricks’ concerts. March 2002: Alessandro performs DEL PERDUTO AMORE during the Sanremo Festival. 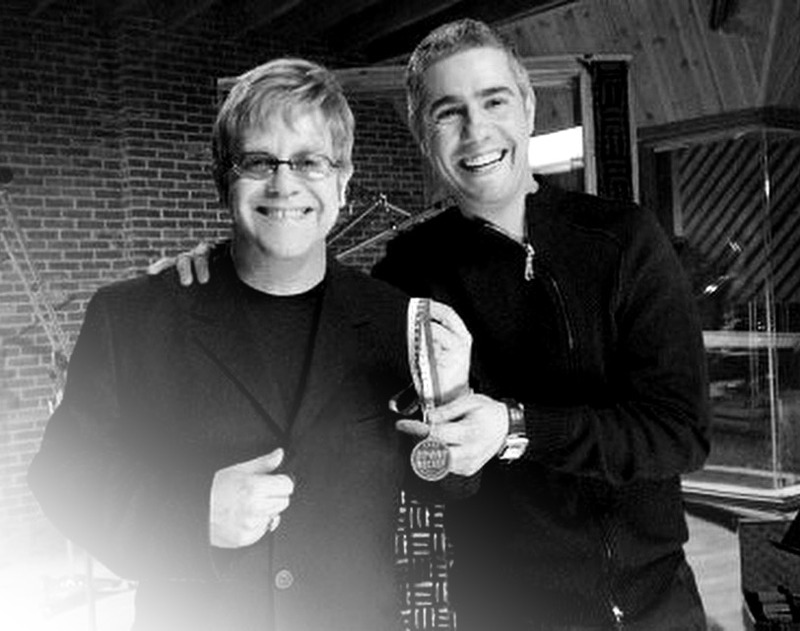 Soon after his marriage in April 2002, Alessandro teamed up with Elton to record YOUR SONG for the second time, for charity fund Sport Relief. The single reached the Top 5 of the British Charts. In May 2002 he went back to his opera roots, taking the stage in Rome to play the part of Danilo Danilowitsch in the opera La Vedova Allegra. Then, off to Seoul for the opening concert of the Soccer World Cup. In July 2002, Alessandro received the Mario Lanza trophy, as a worldwide ambassador of Italy’s ‘Musica Lyrica’. In July of the same year he becomes the proud father of a beautiful son. 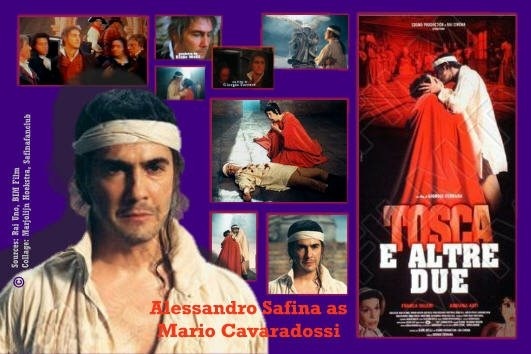 The following year, Safina made his feature film debut, taking on the part of the painter Mario Cavaradossi in Tosca E Altre Due, a movie based on Giacomo Puccini’s opera Tosca. In September 2003 his new album MUSICA DI TE is released with critical acclaim. Contributors to the album include the famous London Chamber Orchestra and renowned guitar player Carlos Santana in the producer’s chair. In November 2003, he appears on the European version of Rod Stewart’s album ‘As Time Goes By’; Alessandro’s warm tenor voice can be heard duetting with Stewart on DON’T GET AROUND MUCH ANYMORE. This is followed by another series of sold-out concerts in The Netherlands, at the famous Concertgebouw in Amsterdam and to an audience of 11.000 enthralled fans in Utrecht; in Korea he performs for the second time this year with Sumi Jo. During the Christmas concert at the Vatican he performs for the Pope. 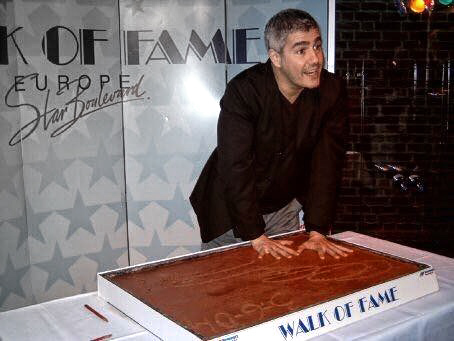 In the summer of 2004, Safina successfully gives three more open air concerts in Tegelen and Maastricht, and immortalises his hands in concrete for Europe’s largest star boulevard, Rotterdam’s Walk Of Fame in The Netherlands. 2005 is marked by the singer’s contribution to the soundtrack album for Korean television series ‘Daejangkeum’. Alessandro records the song HA-MANG-YEON in both Korean and English versions. Following successful concerts in Istanbul with Ferhat Göcer, he performs in Trieste the part of Count Tassilo in the operetta La Contessa Mariza, for which he received a silver medal from the International Association of Operetta. In the summer of 2005, Safina gives two filled-to-capacity concerts with Amii Stewart in the Northern part of Italy. Later in the same summer he finds himself ‘en route’ to The Netherlands again, to perform in Venlo. Early November 2006 he records the duet UN RICORDO for Miriam Stockley’s new album ‘Eternal’. He courts opera once more in February 2007, when he receives excellent reviews for his reprising of the role Danilo Danilowitsch in the operetta La Vedova Allegra, which takes place at the Teatro Piccini in Bari, alongside the soprano Chiara Taiga. Early April he gives another very successful concert in the famous Ritz Carlton Hotel in Qatar. Alessandro’s third album, SOGNAMI, is released in April 2007, and sees the Italian tenor tightening his exceptional position in the contemporary music scene. His unparalleled strength and sensuality, great implicitness, intensity in style and intuitive understatement, are put forth in remarkable fashion by German producer Alex Christensen. SOGNAMI is filled with wonderful songs, a delicately arranged mixture of Venetian flair and ‘Chanson’, Belcanto-enamel and Latin flavour, delivered in Safina’s unmistakable timbre. All in all, SOGNAMI took four months to complete: vocal parts were recorded in Hamburg (Germany), while the instruments and strings were done in Los Angeles (USA) and Bratislava (Czech Republic). In addition to such immediate highlights as John Denver’s ANNIE’S SONG and Charles Aznavour’s TOUS LES VISAGES DE L’AMOUR, Safina covers a wide intellectual and musical spectrum on SOGNAMI. He sings 13 songs in 5 different languages: Italian, English, Spanish, French and even some Turkish. PLANANDO SU TE for instance, both subtle and demanding, is arranged by Chris Walden who actually intended to give the material to Hollywood as a soundtrack, before he decided to offer it to Safina. A wise decision, indeed. “Alessandro surpassed all my expectations because he can work with his voice as if he is working with an instrument. He lets things go and drives them the right way”, Alex Christensen says. “I don’t listen to my old albums if I am recording a new one”, says the singer, “I always try to find songs I really like”. In ANNIE’S SONG, John Denver writes: ‘You fill up my senses, come fill me again’. This is truly the way somebody feels when listening to SOGNAMI for the first time. The album is released in 30 countries. After the release of his new album Alessandro is a guest in many tv-shows and one of the performing artists during the world-wide broadcasted official declaration ceremony of the ‘New 7 Wonders of the World’. Following concerts in Istanbul, including one with one with Sezen Aksu. Theatres are filled-to-capacity and the audience enthralled when he gives concerts in Byblos, Tel Aviv and Rotterdam. His success reaches a record level in November during another concert in The Netherlands, this time in the world famous Concertgebouw in Amsterdam. The same month he records the duet SARAI QUI with Sarah Brightman for her new album ‘Symphony’. Late December 2007 the tenor receives praise again for his role as Count Danilo Danilowitsch in the operetta La Vedova Allegra at Teatro Dell’Opera in Rome. Mid-January 2008 a PBS special of Sarah Brightman’s concert Symphony in Vienna is taped in the Stephansdom, where she and Alessandro duet two beautiful songs: SARAI QUI and CANTO DELLA TERRA. The concert is broadcasted all over the USA and released by PBS on DVD. 2008 has become another prolific year for Safina; concerts in North and South America, Europe and Asia filled his schedule, including very successful duo concerts with José Carreras in Rotterdam and Mario Frangoulis in Athens. In November he joined Sarah Brightman on her Mexican tour. After recording the duets BESAME MUCHO and NON TI SCORDAR DI ME with Sumi Jo for her new album, the two toured together in South Korea. There was a lot on the tenor’s schedule in 2009 too. In February he went on a long and very successful tour of 21 concerts in seven Asian countries featuring as Sarah Brightman’s special guest. In May he travelled to The Netherlands for another short tour. Then, concerts in Israel, Romania and Italy were on his list as well as several performances as Danilo Danilowitsch in the operetta La Vedova Allegra. 2010, 2011 and 2012 were positively dominated by extensive tours, concerts and TV shows in Russia, Ukraine and other CIS countries, but also concerts in many other parts of the world were done, a.o Lebanon, Mexico, Romania, Colombia and Taiwan. In June 2010 the ‘Murex D’Or’ award for ‘Best International Artist’ was presented to Alessandro in Beirut, Lebanon. In March 2011 he received the ‘Solo Star’ trophy during the presentation of the ‘Man of the Year’ awards in Kiev, Ukraine and in April 2011 the award for ‘Popularizer Of Classical Music’ during the ‘Armenia Music Awards’ in the Kremlin of Moscow. From 2013 Alessandro was engaged again for long tours in Russia and Ukraine. Moreover, concerts in Qatar, UAE, Romania, Moldavia, Turkey, Azerbaijan, Latvia, Kazakhstan, Lebanon, Italy, Israel, Mexico and Germany and performances of ‘La Vedova Allegra’ in Italy were on his schedule. Meanwhile, in June 2015, Alessandro received a BIAF AWARD during the ‘Beirut International Awards Festival’ in Lebanon and in March 2016 the ‘International Award in the field of Culture and Arts’ during the XXth Anniversary of the Award Ceremony ‘PERSON OF THE YEAR 2015’. The digital version of his new album DEDICATED – produced by Romano Musumarra – is released in August 2014. 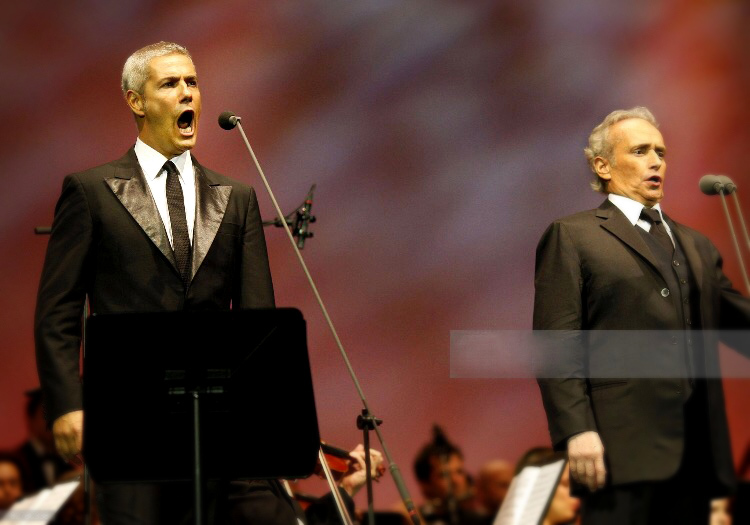 Recently Alessandro performed as a guest of Andrea Bocelli in three concerts in Uzbekistan and Romania.